Your involvement with the ICCU takes place throughout the final three years of training as detailed below. If at any other time you want to speak to someone about a career in critical care, please just let us know. During your 'Foundations of Clinical Practice' time, you will receive a series of tutorials on topics related to critical care. 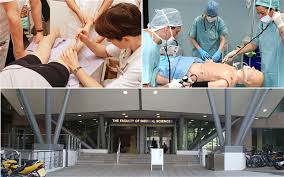 You will also attend the unit for; a tour, a presentation regarding what critical care is about and a simulation session where you will practice using a structured ABCDE patient assessment. During your 'Infection in Clinical Practice' module, you will take part in another simulation session about the assessment and resuscitation of a patient with sepsis. You will also attend the ICCU to observe infection control practices. In stage 4, you have the opportunity to spend 6 weeks with us as a special study component. These can be arranged via the university system, or privately by contacting Dr Mark Carpenter. If you undertake an SSC in anaesthesia, you might visit the ICCU as part of that. During your 'Hospital Based Practice' you will attend a seminar which includes simulation on 'management of the critically ill patient'. For the medicine HBP website click here. During your Surgical HBP, you will attend the ICCU for a day, shadowing the junior medical staff. Please remember that the working day starts at 0800, so you should be on the ICCU before then. If your first placement as an F1 doctor is in the ICCU, you will attend for your shadowing period. Submitting an entry to the annual essay prize is a great way to demonstrate an interest in the acute specialties for job applications. There's also a prize of gift vouchers. The prize is open to all stage 4, 5 and intercalating medical students at the University of Newcastle. The essays of previous winners can be viewed here. For details of the 2018 prize click here.